Made up of thirty super bright LED bulbs separated into two strata to increase illumination area; Suitable for various vehicles as direction light. 1. Part NO: T33-1156-30X-D12 series. 2. 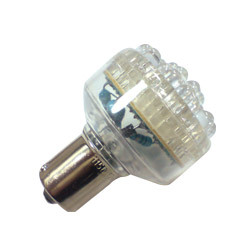 T33-1156-30X-D12 Series include 30 pies LED. 3. Color: red, yellow, blue, green, white, pink. 4. Forward voltage unit (V): 13.2.